The US Army Corp owns 27 Vertical Pumps for flood control. SRS Crisafulli. Crisafulli Vertical Pumps.These are excerpts from a report prepared in 1998 by NORTHWESTERN POWER EQUIPMENT CO. INC. Regarding the purchase and use by affected cities, as advised by the U.S. Army Corps of Engineers of 27 Crisafulli Vertical Pumps in sizes ranging from 10" to 16" for flood control applications along the Red River Valley of the North. Historical Background: Lake Agassiz was formed during the last glacial period when the glaciers melted and receded to the north. It covered thousands of square miles in northern Minnesota and North Dakota. Much of the glacial melt water went south, scoured out the Minnesota River Valley and assisted in the formation of the upper Mississippi River. As the glacier finally melted, the rest of the water (which had formed Lake Agassiz), drained and became the "Red River Valley of the North", which flows between Minnesota and the Dakotas, through Winnipeg and Manitoba Province, eventually into Hudson Bay, Canada. During the winter of 1996-1997 there were seven or eight major blizzards and heavy snowfall in this watershed area. The Canadian portion of this watershed was still frozen when the spring thaw hit in 1997. Most of the dikes along the Red River were not built high enough to accommodate this much water. All of the predictions from the Corps of Engineers and expert hydrologists were below what actually occurred. The flood waters rose to record levels and stayed for up to six weeks in some areas. The U.S. Army Corps of Engineers, along with several consulting engineering firms, had been busy in the last year designing and building higher levees and/or bypasses for some of the communities along the river. A billion dollar ditch that bypasses Winnipeg was instrumental in saving most of this city. However, the Corps of Engineers determined that this type of construction is not cost-effective for many of the communities along the Red River in the USA. Most communities, therefore, are enhancing their dike and Storm water systems by installing more permanent pumping and control structures. 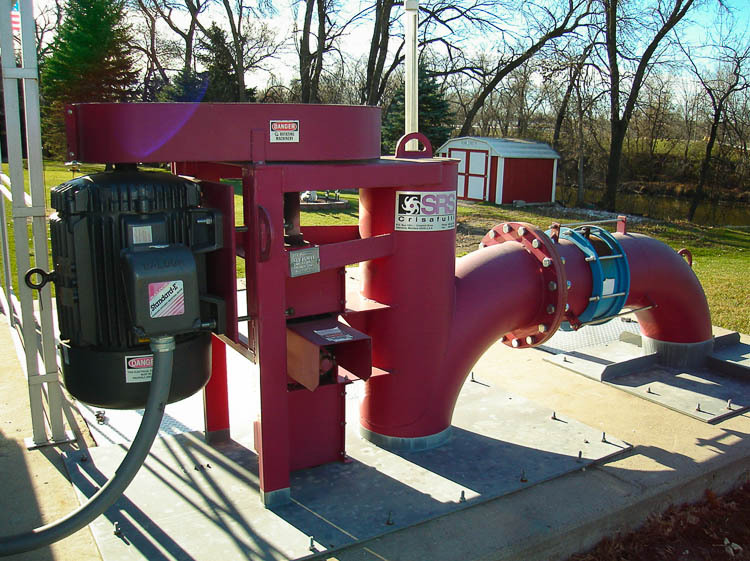 Most of these communities are familiar with the tractor-driven Crisafulli pumps so it was natural for the engineer on the Breckenridge (MN) project to utilize this design in a permanent installation. He actually prepared and took two separate specifications: one for a vertical propeller pump, and one for the Crisafulli design. Even though the Crisafulli pump required more horsepower, it was a better application for this project because it did not require screening. Another feature of the Crisafulli pump is its low profile. Even with the right angle gear drive option, it was three or four feet shorter than the propeller pump with a combination right angle gear drive. The aesthetics of this lower profile are significant when the pump is located on top of a 25 foot high dike. It also lends itself to any future fiberglass enclosure that could be installed in the future for vandalism protection. Visit: Northwestern Power Equipment Company.